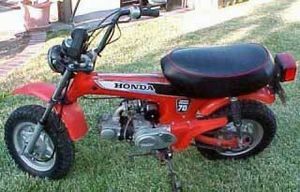 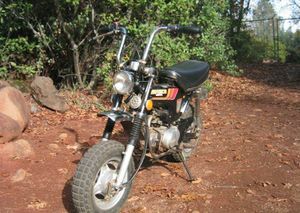 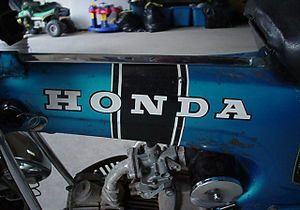 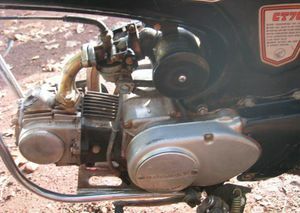 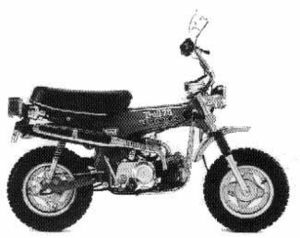 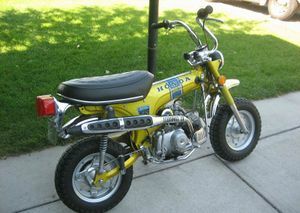 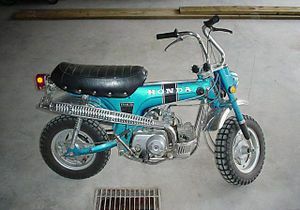 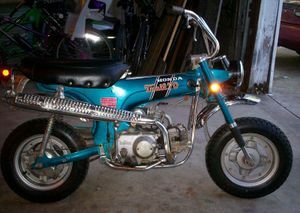 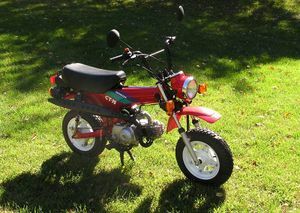 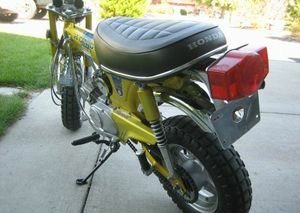 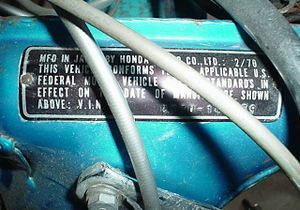 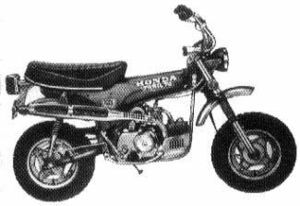 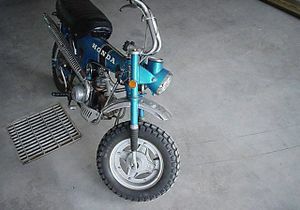 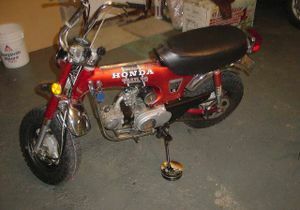 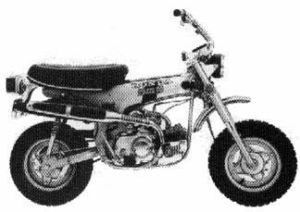 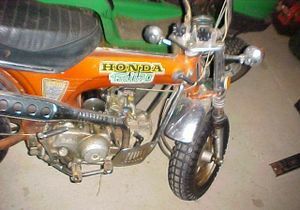 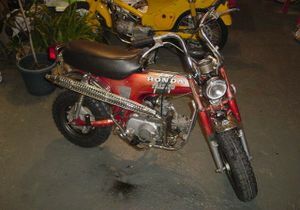 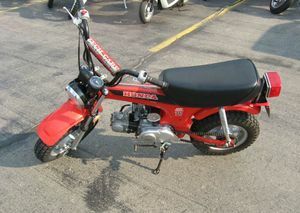 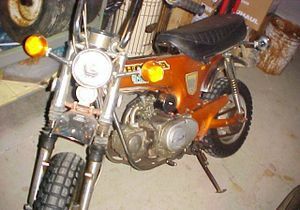 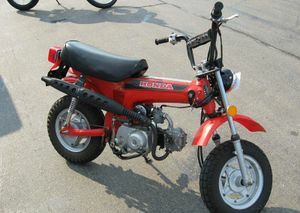 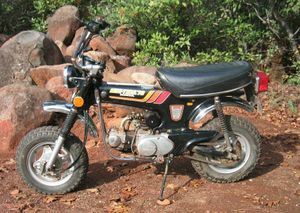 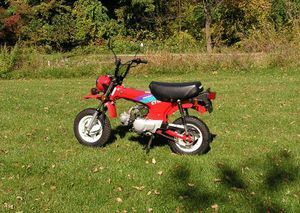 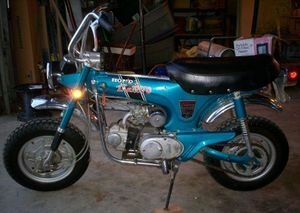 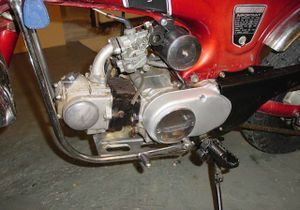 The Honda Minitrail CT70 also known as the Honda ST series in Canada was a 70cc 4-stroke, OHC, dual-purpose motorcycle or larger than usual minibike manufactured by Honda from 1969 through 1994. 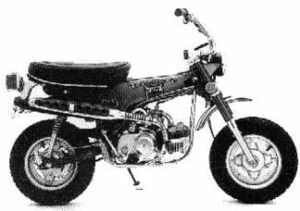 The CL70 shared the same engine with its taller cousin, the Honda CL70. 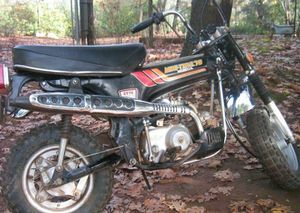 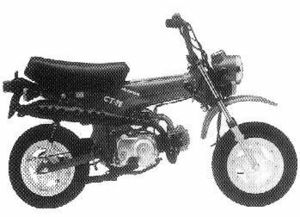 The CT70 served extremely well as an off-road motorcycle. 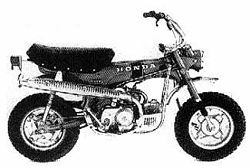 Sometimes referred to as a Honda Dax it was distinguished by a pressed-steel "T-bone" frame, and equipped with folding handle-bars. 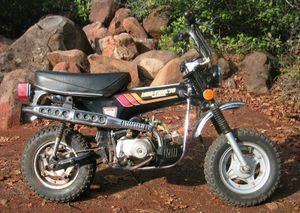 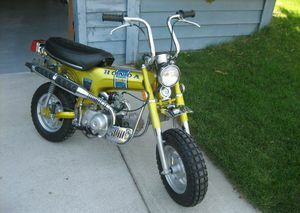 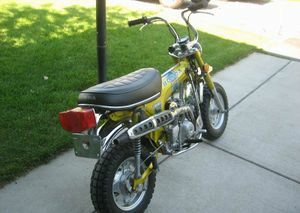 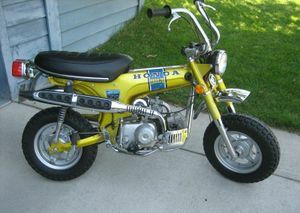 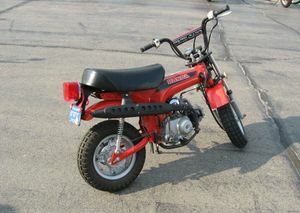 It was small enough for children to enjoy, but powerful enough to get an adult through the most rugged of trails. 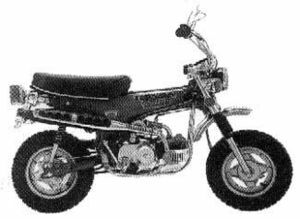 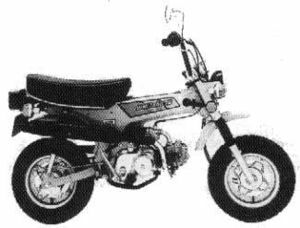 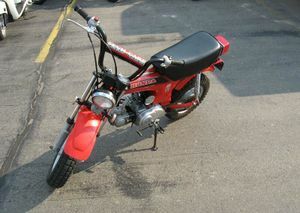 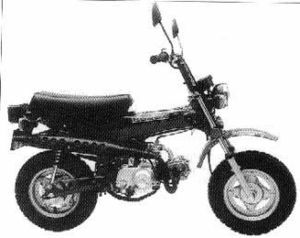 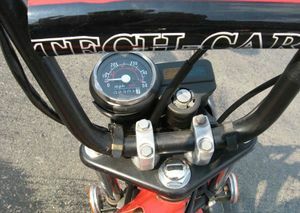 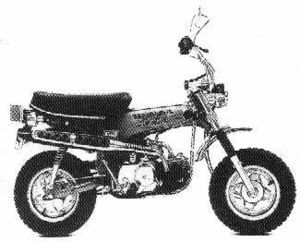 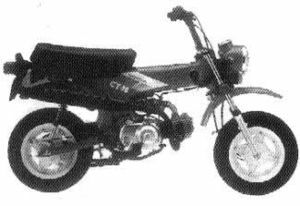 Success of the CT70 was due its appeal as an entry level street legal motorcycle as well as its portability and convenience. 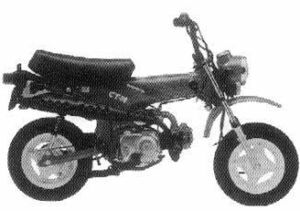 The compact CT70 weighs only about 143lbs and can easily fit into the trunk of a car once it's adjustable handle bars are folded down it's sides, and the footpegs are folded upwards. 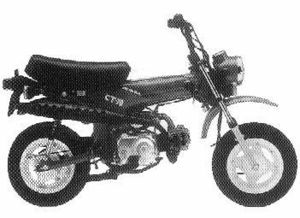 It was also one of the first in it's class to be marketed as environmentally friendly motorcycle, being equipped with USDA approved spark arresters / mufflers. 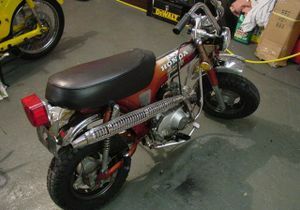 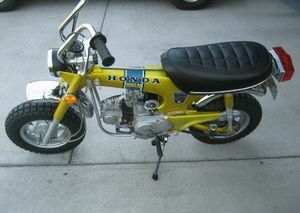 Today, the Honda CT70 is largely a collectors item for vintage motorcycle enthusiasts. 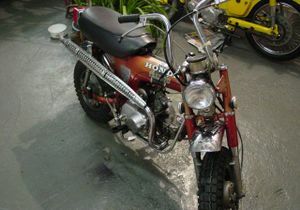 Many people who still own these bikes have made them their subject for a restoration project. 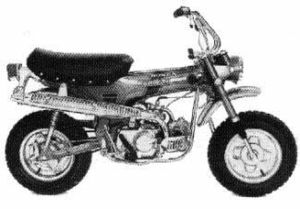 There are still many websites that cater to mini trail bike owners by selling parts, offering technical help and giving users a place to talk about their beloved bikes. 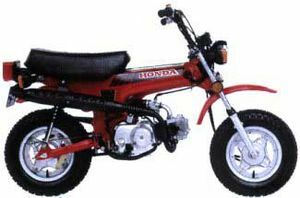 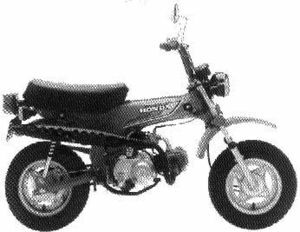 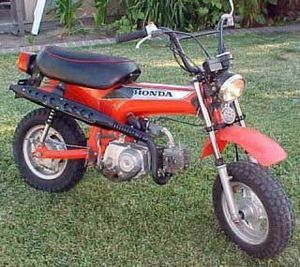 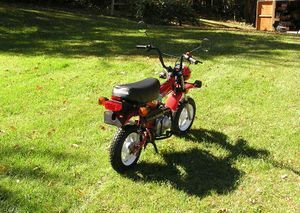 Although it was discontinued in 1994, this bike, along with other Honda trail bikes such as the Honda Z50, Honda CT90, Honda CT110 and Honda ST90 was a true pioneer in its day, and paved the way for all kinds of mini motorcycles and trail bikes for years to come. 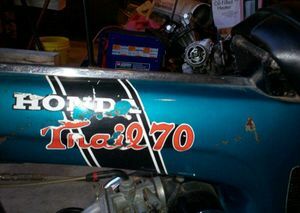 Decal "TRAIL 70" was red and the stripe was black. 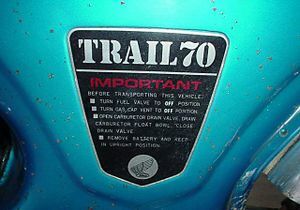 The "TRAIL 70" decal was white, outlined in orange. 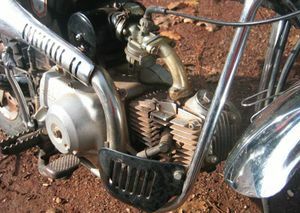 Transmission: 3-speed with manual clutch. 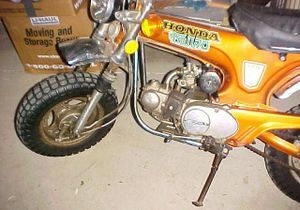 The upper fork and headlight bracket was Shiny Orange. 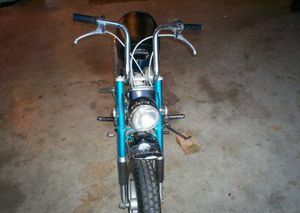 The frame downtubes and skidplate were deleted. 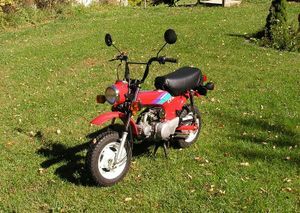 Basically the same as the 1991 model except the stripes were purple and blue-green.